Archive of posts tagged with "europe"
Despite my relative silence here this summer — about which, more soon — big tings a gwaan, especially as the fall semester rolls around. Holland’s bubbling scene of the 1990s was so unremittingly anchored in local sites of realtime production and material circulation that in two decades, with few exceptions, the genre has hardly migrated beyond Rotterdam and the Hague. In marked contrast, contemporary Dutch house producer Afrojack, whose style audibly emerges from a national club music inspired by bubbling’s distinctive take on foreign but familiar forms, could credibly be counted among today’s top-tier producers of global dance-pop (if often overshadowed by US-based partners such as Diplo and Pitbull). 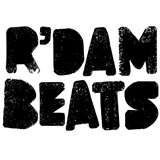 Moreover, Afrojack’s remix of “Moombah,” slowed down several clicks by a Washington DC-based DJ named Dave Nada, has served as the basis for an emergent genre, moombahton, that enjoys a similar breadth of engagement and international circulation, but with relatively little attention to questions of Dutch origins — again, offering a striking departure from bubbling’s insistent locality and marginality. Although at a glance, then, the formal aesthetic qualities of mid-90s bubbling and today’s moombahton might have a lot in common — highly referential and resonant drum loops, Afro-diasporic signposts, a strong embrace of denatured synths and samples — a closer attention to their particular contexts and technologies of production and circulation can reveal striking shifts in the cultural politics of urban Holland, and the wider wired world, in an age of digital and so-called “social” media. Tracing the shapes and forms of Holland’s club music from bubbling’s Antillean counterpublics to the multicultural mix of participants addressed by Dutch “dirty” house and moombahton, this paper examines the distinct media ecologies that fostered the rise of such styles while considering the implications for understanding how musical media can facilitate forms of social collectivity and interaction, mobilization and disarticulation, audibility and illegibility. The second upcoming event I want to mention here is another DJ gig of sorts. On the evening of September 7, I’ll be performing at openLAB_03, a gathering at Harvard’s cool new experimental research unit, metaLAB, happening in conjunction with the Berkman Center’s iLaw conference. The directors have been using the openLAB event series to present projects from Boston-area artists and share ongoing metaLAB experiments with the public. The theme of openLAB_03 is remix/curation of media archives (“broadly interpreted,” I’m told). Along these lines, they’ve asked me to reignite the Boston Mashacre/Smashacre stuff I worked up a few years ago, and I’ve decided that the next chapter in this series of sonic explorations of Boston’s sound(scape) will focus on radio transmissions. Although I haven’t had a chance to write about the subject here yet, I’m deeply interested in how Boston’s radio landscape offers a uniquely audible picture of the city and the people who live here. The vivid, if often muted, presence of low-power and “pirate” radio stations — especially emanating from Caribbean communities — is something I’d like to explore, and accentuate, especially alongside the crushing amount of hi-fi, ClearChannel, middle-of-the-roaditude that saturates the airwaves here. In terms of aesthetic procedures, I plan on toying with degrees of distance and difference, signal and noise. To that end, I’ve been making my own “personal” (and/or public) archive of Boston radio scans, which I plan to cut up and loop and reassemble in the spirit of, e.g., my 2003 Jamaican radio edit. Not sure yet about the title — think I’ve exhausted the (s)mashacre schtick, so maybe something like “Towers of Power” — but, at any rate, I hope something suggesting these power relations emerges in the performance. Will share in audio form here once I get a chance to bounce it all down, but please do come to openLAB_03 for the live mix if you’re in the area. Association with the Berkman Center is always a felicitous thing, IMO, and I’m happy to report that, in addition to this latest bit of convergence, I’ve been selected to serve as one of the Berkman Center’s Faculty Associates for the 2011-2012 academic year (alongside a humbling list of luminaries). 1) On Monday evenings from 5:30-8:00 at UMass-Boston, I’ll be attempting to fill the very large shoes of Reebee Garofalo, who is retiring, teaching his perennial and popular course on the “Social History of Popular Music.” This is a great opportunity to dig into the question of the “popular” and how it opens into, emerges from, and informs social history. I’ll share the syllabus here as soon as I’ve got it into good enough shape. It’s being offered through the American Studies department (AMST 235). 2) On Tuesday nights from 6:30-9:20 at Brandeis I’ll be returning to the topic of “Reggae, Race, and Nation” for the department of African and African American Studies (AAAS 171a). The syllabus will not look too unlike my Global Reggae course for MIT (now on OpenCourseWare! ), though I will be tweaking it a little, of course. These topics are near and dear to my heart & work, and I feel fortunate (if a little undercompensated — twice the teaching for 20% the pay!) to be able to continue thinking and talking about music, popular culture, and social history & theory for a “living.” Nice work if you can get it. Do help me out by directing good students my way! Hope to see some of y’all at some of these things. And I promise to fill you in on my Summer of Relative Silence very soon. Also, I’ve got some pieces of writing to share. Soon come, patient readers, soon come. I’ve received repeated requests to share the text I delivered in my pre-concert talk for the Nettle residency at Brandeis. It’s only taken me four months to post it here finally. Regular readers of this blog may find certain passages familiar; some are literally cut-n-pasted from posts here (where I do a lot of my thinking-aloud / work-in-progress). I’m glad so many attendees found the talk provocative — it was supposed to be — and I hope that people reading it here will also find food for thought. If I come across as something of an advocate, that’s because I am. 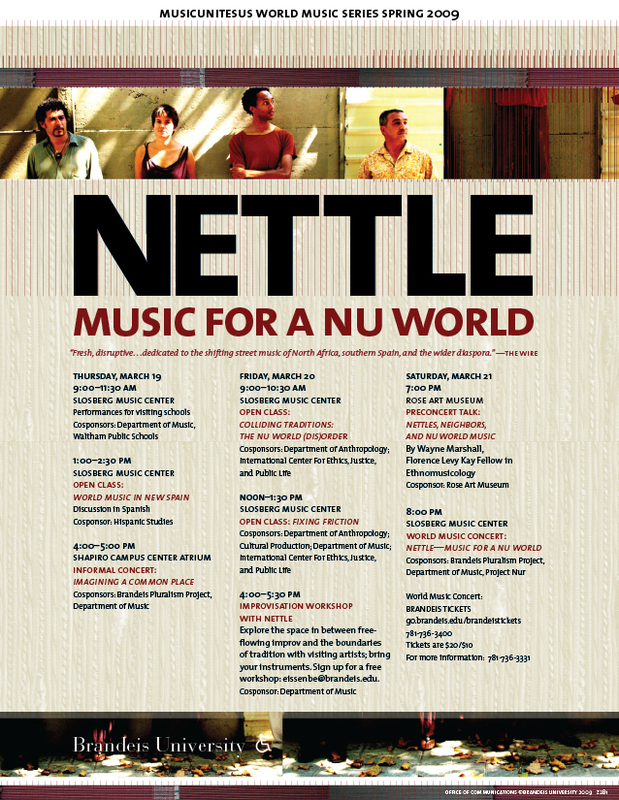 Thanks again to Nettle for being so generous with their time and their thoughts, many of which helped to shape this speech and continue to resonate as I try to make sense of “new”/”nu” “world” music. Thanks also to all the thinkers and writers and scholars and poets, linked & quoted below, who’ve helped me shape and reshape these ideas. I would like to echo Judy‘s thanks to the Rose, and to all the organizations and individuals that have made this event possible. Special thanks to Scott Edmiston and Ingrid Schorr in the Office of the Arts. And, of course, to thank all of you for attending tonight’s concert, the culminating event of what has already been a wonderful residency. Thanks especially to Judy Eissenberg, the soul of the Music department and a crucial voice and mediating presence in the Brandeis community. MusicUnitesUS should rightly be recognized as a hallmark institution here at Brandeis, in part because it so powerfully speaks to so many of the university’s would-be core values, as I hope to suggest here tonight. It was very important to all of these people, to all of us, to make this MusicUnitesUS program, this spring residency, a reality. This is important for its own sake, as I’ll discuss in a moment when I tell you about our guests, Nettle, but important also because of the precarious position that the arts finds itself at this moment of institutional and financial crisis. Our commitment to and our ability to put on as challenging and interesting and lively a residency as Nettle’s should serve as a potent reminder of the treasured and critically important role that artistic practice plays in our communities. It feels quite appropriate to speak about such issues here in the Rose. In all the talk about the value of the museum — and in particular, its holdings — that has animated so much contentious chatter in recent weeks, we often lose sight of the more intangible reasons the Rose is so valuable not just to us at Brandeis or in Boston, but to the worldwide arts community. The Rose has, simply put, been a champion in promoting contemporary art, art which provokes us to think and rethink our situation and our selves. Art that does so by operating on the cutting edge, beyond canon, or at the margins of putative mainstream culture. In this way, it offers a service to the community — to various overlapping communities — which finds a parallel, a partner, in MusicUnitesUS, both institutions projecting into several public spheres — and we can imagine campus, local, national, and global publics — art and artists that deserve that humble push from margin to center. This spatial metaphor is not inappropriate in coming to terms with our guests tonight, and this week, at Brandeis. Nettle offers what we might hear as a form of decentertainment — and this is crucial, I contend, to the idea of a NU world, and of a NU WORLD MUSIC which not only reflects our new social configurations and cultural repertories but informs the shapes they take. The Nu World I am describing here (and signifying with NU so as to be clear that I am not simply referring to the Americas) is a strange kind of neighborhood, made to feel as such despite its global scale because of the ways that new technologies create social and discursive networks that allow us to imagine and interact with our respective communities in heretofore unimaginable ways. The Nu World phenomenologies, if you will, which emerge from these new configurations are not, however, simply a product of an unprecedented degree of access and connection to far-flung places; these new ways of feeling — of inhabiting and refashioning selfhood, nationhood, and neighborhood — are coalescing at the same time because of the ways that our cities have been radically transformed in the wake of decolonization and globalization. Not only are we more able to access some “world” out there, we are increasingly aware that the world is all around us. of … articulating cosmopolitan hope upward from below rather than imposing it downward from on high provides some help in seeing how we might invent conceptions of humanity that allow for the presumption of equal value and go beyond the issue of tolerance into a more active engagement with the irreducible value of diversity within sameness. There is another quite different idea of cosmopolitanism to be explored here. … This cosmopolitan attachment finds civic and ethical value in the process of exposure to otherness. It glories in the ordinary virtues and ironies — listening, looking, discretion, friendship — that can be cultivated when mundane encounters with difference become rewarding. This notion of everyday, mundane difference, an otherness that can easily collapse into recognitions of sameness, is precisely what too often is missing from or distorted in the marketing category of “world music,” a category which, nonetheless — as we discussed with Nettle yesterday — remains a useful way for musicians to find audiences and patrons. To my ears, and as they would have it themselves, Nettle militates against this uniformity of reception. Even as they pragmatically embrace the term world music because of the cultural work it does and economic doors it opens, they also simultaneously subvert it. They abandon the easy fusion of World Music clichés for the intricate realities of border-crossing and cohabitation. Despatializing and respatializing with their geography-defying mix of traditions, textures, and timbres, Nettle seems to embody one rich set of possibilities within the flexible matrix of nu world music and culture. The group troubles facile distinctions between the world and the West by giving the lie to these false binaries, bearing witness instead to a world of routed roots and rooted routes, of traditions with multiple origins and fractal futures, diasporas within diasporas, turtles all the way down. DJ and producer Jace Clayton (aka DJ Rupture), a native of Massachusetts, formed the group earlier this decade while living as an ex-pat in Barcelona along with several other ex-pats (one from Scotland, a couple from Morocco, others from the US) — all of them speaking second or third languages in order to converse with each other. All of them, as they told us this week, feeling equally uncomfortable, out of place in their new home, and hence seeking a common place — and this is where music comes in — but NOT striving for unity. Rather, they sought to create and inhabit heterogeneous spaces, enjoying what they had in common but also what made each member distinctive in what they brought to the group. Briefly, we hear in Nettle a collision of traditions, from Afrodiasporic electronic dance music to Berber folk songs, Arab and Andalusian pop to the Afro-Arab trance music of the Gnawa. The Maghreb via Spain via the Maghreb filtered through the black boxes of a globe-trotting DJ. Indeed, the distinctive sonic space Nettle creates seems to signal this desire to live with difference, a desire which more often finds the group preferring metaphors having to do with holding one’s ground and inhabiting spaces than with crossing borders, with deploying various notions of noise, with embracing friction as a creative force. This place of friction, where the rubber meets the road, if you will, stands in contrast to other metaphors for globalization, especially those that emerge not from social and cultural spheres of activity but from economic ones, where capital is said to be frictionless and where fluid and easy crossings and flexible accumulations are the order of the day. In this manner, Nettle’s music fingers the pulse of contemporary social theory _and_ social experience. Friction is not about culture clash, it is a more complex and subtle force than that. Friction is what anthropologist Anna Tsing calls “the grip of worldly encounter” — especially in “zones of awkward engagement.” The metaphor of friction suggested itself to Tsing b/c of the “popularity of stories of a new era of global motion” so commonplace, perhaps triumphant even, in the 1990s. We see in some ways how these stories of global motion are true: all the musicians in Nettle did, after all, find themselves and each other in Barcelona, a home away from home for them all; but these stories are also clearly, resolutely untrue in other ways: take for instance, the group’s thwarted attempts to travel together in the past, or the fears and precautions and difficulties we worked through to ensure they could make it here this time. For all the promise of an integrated and deeply interconnected world — A NU WORLD — and more tolerant, diverse cities where any and all may inhabit and enjoy, we suffer from an insidious tendency to ignore the divorce between rhetoric and reality, to embrace the symbols of diversity and tolerance and forget enduring inequalities and asymmetries. Socially, it is important not to assume a direct relationship between aesthetic strategies (i.e., those operating in texts and performances of various kinds) and those of everyday life, particular among migrants and others living lives of enforced, rather than chosen, cultural fragmentation and hybridity. … At a general level, the fantasies characteristic of migrant music, film and dance, modernity, cosmopolitanism, upwardly mobile romance, and technological mastery must be understood in relation to the limited life chances and the endless and humiliating accommodations for the bureaucracies and work routines of host societies that characterize migrant everyday life. The cosmopolitanism of the rich thus must be clearly distinguished from the cosmopolitanism of the poor, even when the techniques and imaginaries of such cosmopolitanisms have common elements. Given these constraints and concerns, something like “boundary smashing” — a world music cliche if there ever was one — is not an aesthetic project that appeals to Nettle. Despite their philosophical suspicion of, perhaps even hostility to, all kinds of imaginary borders — lines drawn between genres, places, people and so forth — we run into real walls and fences all too often to pretend they’re not there. Friction and dynamism are, instead, the group’s metaphors of choice. My research often focuses on issues of nationalism and transnationalism, but lately I’ve been thinking less about nationhood and more about neighborhood — not in terms of an actual space or place (though that’s part of it), but something more akin to neighborliness, to being a good neighbor, to finding an ethics of neighborhood in an intensively globalized/mediated era. I’m curious about a musically-mediated aesthetics more specifically — one that responds not to the condition of living in a world of strangers, as Anthony Appiah might put it, but in a world of neighbors. This is a concept that I hope will be useful in coming to terms with what I’ve variously, loosely, referred to as nu-whirl music. My embrace of “neighborhood” is meant as a way of reading nu-whirled music and movements in an engaged, positive manner. It, hopefully, moves away from notions of the foreign to the familiar. It recognizes that we become familiar with our neighbors when we have some regard for them, when we listen and play collectively. It proceeds also from a concern that if we are moved to work towards mediating the myriad conflicts in our world, especially those geopolitical conflicts that engulf and destroy so many people and places, that we must necessarily begin in our own backyards, as the saying goes — or in our own neighborhoods. This is part of what underlies the mission of MusicUnitesUS. When I met Judy Eissenberg last year and she told me about the program & how she was inspired to start it in the wake of 9/11 as a way of embracing and exploring cultural difference though the special, mediating powers of art and music, I thought almost immediately of Nettle. Whereas MUUS residencies in the past have offered an opportunity for intercultural exchange, bringing representatives of some ‘non-Western’ society to share their traditions with the Brandeis community, what is crucial about Nettle is that the group already embodies that process of encounter and exchange, and, moreover, that they choose to embrace moments where they “get under each other’s skin,” as bandmember Jace Clayton puts it. After all, that’s what Nettles do. But we might wonder whether Appiah fails to go far enough — “getting used to each other” is a relatively weak, if gentle, model for learning to live with difference; and we might ask whether Gilroy goes too far in demanding so much translation. The music of Nettle, and they way they talk about what they do, seems to suggest that not everything is translatable or need be translated for us to agree to be convivial. Indeed, in seeking to translate everything, we also run the risk of erasing difference. In this manner, Nettle resists the temptation, if only rhetorical, of smashing boundaries or knocking down walls — at least certain kind of walls. Frost’s sentiment seems undergirded by a less suspicious perspective, which is perhaps an outdated notion of the neighbor, the one who dwells near — but perhaps one that could use some new life breathed into it. the figure of the neighbour … is rapidly becoming (if it has not already become) one of danger, marking the potential malevolence of dense living, of a community too close to our sovereignty. And it is precisely at this interface of community and sovereignty, at the imaginary line that separates ‘them’ from ‘me’, that the story of the noisy neighbour can be told. the neighbour, the bearer of noise, becomes the symptom of the new sonic disposition and it falls to the neighbour therefore to bear all the anxiety of his or her Other as one with whom we fight for limited resources. For all of the ambivalence around neighbors, however, that is, despite that they may remain, as Biddle puts it, “harbinger[s] of disquiet, … literally, the bringer[s] of noise,” I suppose it depends on how we feel about noise, at least we city folk. For exploring that shimmering line between sovereignty and community, self and other, music and noise, is, and must be, an ongoing project for all of us. Perhaps, as some suggest, that process of exploration is foundational to our very ability to learn and grow. I wonder whether we might hear this important impulse in the music of Nettle — in particular the way the group draws on music from North Africa and the Arab and Islamic world, employing musical signs that have become deeply fraught with contradictory meanings, overdetermined in the War on Terror. Despite this embrace and projection of the symbols of one of Europe’s most contentious and yet constitutive Others, we might do better to hear Nettle’s music not as another instance of orientalism, but advancing a kind of disorientalism, which seems especially appropriate in a world which has lost a great deal of its coherence as grand narratives have collapsed, as the integrity of cultural borders falls away, as we all increasingly draw on a fragmentary set of resources and symbols and texts to make sense of who and where we are. Festivals, choral movements, folk-music collecting projects, the mixing and remixing of Europop repertories. These are the musical sites at which fragments are gathered and new processes of reconciliation converge. The struggles of nationless Europeans. The revival of repertories by the most repressed of Europe’s Others. The sounds of a New Europe thrive because they are fragmentary and because they belie the hegemony of empires and new world orders alike. Nettle challenges us to hear suggestive fragments and elusive wholes. As we hear hip-hop and dub, gnawa and sha3bi, flamenco and genres unnamed, we also hear New Spain, New Europe, Nu Worlds to explore and inhabit. At the same time, we should resist hearing a series of discrete authentic traditions coming together to form a new authenticity, that of the hybrid. For if we do so, we risk overwriting the map-less-ness that the group pursues and projects. Perhaps we would do better to hear Nettle as residing not in Barcelona of the New Spain or in the interstices of internet nodes, but in what Zadie Smith calls “Dream City,” a place that seems not unlike our contemporary polyglot cities but a place that is as much state of mind, a phenomenology and an ontology, how we feel and how that shapes our sense of who or what we are. It is a condition that marks the in-between experiences of people of mixed family backgrounds, but it is a sensibility that has come to resonate more widely, as evidenced, she proposes by the election of Obama and the multiple voices with which he speaks. had the audacity to suggest that, even if you can’t see it stamped on their faces, most people come from Dream City, too. Most of us have complicated back stories, messy histories, multiple narratives. … It was a high-wire strategy, for Obama, this invocation of our collective human messiness. His enemies latched on to its imprecision, emphasizing the exotic, un-American nature of Dream City, this ill-defined place where you could be from Hawaii and Kenya, Kansas and Indonesia all at the same time, where you could jive talk like a street hustler and orate like a senator. What kind of a crazy place is that? But they underestimated how many people come from Dream City, how many Americans, in their daily lives, conjure contrasting voices and seek a synthesis between disparate things. Turns out, Dream City wasn’t so strange to them. And isn’t this sense of plurality, for all the difference and dissonance it necessarily entails, all the eruptions of untranslatable noise — isn’t this what harmony is really about — seeking sweet moments of interplay which can only be sweet in the presence of the unsweet? Isn’t this a model not of conflict, but of acting in concert? Let us recuperate then, recultivate a sense of neighborhood, of noises and nettles and unfamiliar idioms as things to be embraced for precisely their resistance to our tendencies to retreat into likeness and familiarity. Let us appreciate how noises and neighbors — and the walls they erect — allow us also to hold our ground, to inhabit spaces with a difference, even as we seek still to let certain walls fall, walls that can prevent the dynamic process of musical collaboration from happening at all. This seems to be what the group was getting at in our conversation yesterday when they reminded us that it’s good, even necessary, at least sometimes — maybe often — to knock down certain walls. The walls of suspicion or guardedness for instance — since improvisation and sensitive group interplay demands a certain degree of trust and openness. wrote Frost, and music is surely one such force, an elemental groundswell, a thing that resists boxes and borders, that permits sacred signs to enter secular spaces, among other magic tricks. I was quite struck by how the group described itself yesterday as, in some sense, more of a “social project” than a musical one. Music unites them, gets under their skins. As Clayton has written elsewhere, we make a border real by policing it. We would do well to bear this in mind as we prepare to listen with open ears to Nettle, as we let down some of our own walls in order to appreciate the interpenetration so central to their sound and signification. "Cebu Provincial Detention and Rehabilitation Center is a maximum security prison in Cebu, the Philippines. Prisoners at Cebu are considered the most dangerous offenders in the Philippines awaiting trial. But thanks to four hours of dance lessons a day, their behaviour has been transformed." :: o rly? collection of videos from those wacky inmates at CPDRC in the philippines — i'm pretty floored by how many of these there are, how many take (af-)am music(videos) as their model, and the fact that these are on youtube at all & apparently uploaded by the warden himself?! 'randy barracuda' is an awesome name, esp at this moment in time what with VP candidate, 'sarah barracuda,' going "heels on, gloves off"
skeletal wiki page for skweee — "Skweee is a musical style, with origin in Nordic countries Sweden and Finland. Skweee combines simple synth leads and basslines with funk, r'n'b or soul-like rhythms, overall rendering a stripped-down funky sound. The tracks are mostly entirely instrumental, though there are exceptions." video archive dedicated to old school hip-hop: documentaries on the music & related practices, plus street gangs, etc. Last week I gave a guest lecture in a “Global Pop” class at MIT. The professor, Patricia Tang, asked me to come in and do my thing where I show how various genres cohere depending on tempo and rhythmic pattern. It’s a shtick I’ve had going for years, using Ableton (or, previously, FruityLoops) to make hip-hop morph into dancehall into reggaeton into soca into techno and so on. At any rate, the presentation went fine and the students seemed to enjoy it. At first, far too familiar with such a situation, I half-smiled at the joke and said “yes.” But then, thinking better, I said “sì,” since she seemed to be implying that her language was Italian or something. She looked perplexed. We left the room. For the last week or so the episode has been nagging me. I now wish that I had originally only replied in Italian (if only I were fluent in Italian). Or asked her what the hell a non-rhythmic ostinato might sound like. Ah, Eurocentrists. They would be more amusing if they had less power.